(Nanowerk News) Stem cells are widely considered a major new hope in medicine because they are capable of differentiating into a broad variety of human cell types. This characteristic makes them particularly interesting for recreating irreversibly damaged tissues, following a heart attack for example, or in cases of injury to the spinal cord. Researchers at the Institute for Hygiene and Biotechnology (IHB) at the Hohenstein Institute have successfully devised a special, optimised textile coating that allows adult human stem cells to colonise the surface fibres of textile implants. A molecular layer of natural biomaterials from the human extra-cellular matrix has been developed for this purpose. Cell colonies derived from the body cells of the patient allow the tiny "all-rounders" to be placed directly at the site of damaged tissue. New cardiac muscle cells, for example, can be generated by introducing certain factors. These can then be used to replace parts of the heart that have been destroyed during a heart attack. Human stem cells colonizing a textile implant. 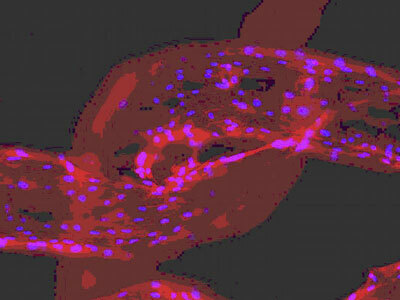 Bioresorbable textile fibres that have been colonised with cells as seen in a fluorescent microscope: the nuclei of the stem cells appear in blue, while the cytoskeleton has been marked in red. The head of the IHB, Dr. Dirk Hoefer says, "This is an initial success in the direction of textile stem cell therapy. But we still need to develop better understanding of how stem cells colonise - meaning interact with - fibres. Therefore, we will continue working on optimising colonisation of textile implants in order to provide as many cells as possible per unit of fibre surface and with the required factors in a targeted way. " Adult stem cells are found in many types of human tissues and, unlike embryonic stem cells, do not have to be harvested from human embryos, a controversial approach that is frequently rejected on ethical grounds. The mesenchymal stem cells used by the scientists are multipotent, meaning that they can, for example, develop into heart muscle, bone or cartilaginous tissue. Colonising stem cells on textiles opens up far-reaching therapeutic possibilities for regenerative medicine. Textile implants are frequently used during surgery requiring the stabilisation of injured tissue. There are, for example, heart patches made of biomaterial that can be applied to damaged cardiac tissues. After a certain time, the implanted biodegradable foreign objects are dissolved by the patient's body. The aim of the researchers at Hohenstein is to colonise diverse textiles with human stem cells in the laboratory and then to convert them directly into the cell type of the target tissue. The scientists are also currently working on a technique for colour-marking the stem cells in order to make it possible to identify them even after differentiation into heart, cartilage or bone tissue, as well as ease following the post-implantation progress of colonised textiles.